So back in January, I sent a couple of posts in that my husband and I were going to try at least one new recipe each month. We’ve been successful so far, but I have barely written about them recently! This month, however, I was inspired to do so because our new recipe was just *that* good. My husband decided that he wanted to try risotto, as he has seen it on TV a lot. (We love watching food competition shows.) I did some research online, and found a few recipes that sounded interesting, but nothing that blew me away. Since I’d like to think that I’m a pretty decent cook who can improvise, I took the basic recipes I found and made them my own with what I had on hand. 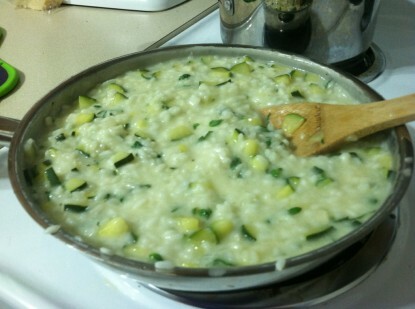 The result was zucchini basil risotto, which I have to say, is pretty darn good! After I cut everything up, I warmed about one tablespoon of olive oil on medium heat, and sauteed the onion and garlic until translucent. To this I added my rice (raw) and cooked until it too started looking translucent. I then added my zucchini and cooked it for about a minute or so until it just started to soften. The next part is where the real work and patience paid off. 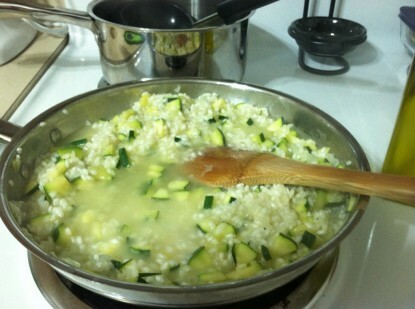 Once the zucchini was soft, I added one ladle of my warm stock and stirred until the broth was absorbed by the rice. This took about two minutes, then I added another ladle. 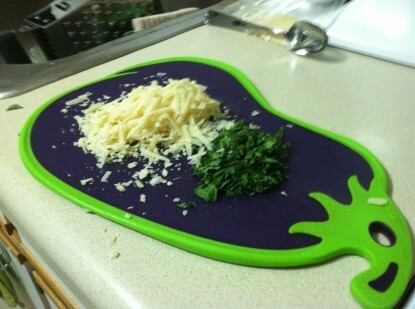 I repeated this until the rice was al dente (still a *very* small crunch to it) then I stirred in my cheese and basil. When I added the cheese, I had about two ladles of broth left, which was perfect. After the cheese melted, I stirred in one ladle of broth, and let that absorb. At this point, my skillet was pretty much filled to the brim. I had not factored in how much the rice would expand in the cooking, but now know to use the largest skillet when making this again. Right before I served the risotto, I stirred in the very last ladle of broth, but didn’t wait for that to absorb. This made the dish really creamy without having to add anything extra, like actual cream or more cheese. I have to say, after making this, that I was extremely pleased with how the dish turned out. It was not very much work, just time and patience, and resulted in a huge batch. There was enough for four very large bowls, which was more than enough for just the two of us. Oh, and the fact that my husband has requested this again already (it’s only been one week!) means that it is a winner in my book. I think next time I try it out, I will experiment more with my ingredients and will try swapping the vegetable for what else may be in season. I foresee lots of corn risotto the rest of this summer, and maybe butternut squash in the fall! 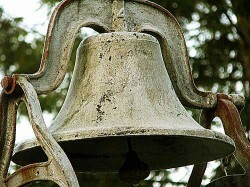 < Do you have a recipe post or kitchen-related story to share on the Farm Bell blog? Peanut Butter Cookies with No Flour? This looks excellant! I cannot wait to try it out. The last time I made risotto I used a seafood stock that I made from a “concentrated base” I bought from soupbase.com. (amazing quality stuff) It was really really good. I’ve been wanting to try risotto with some garden veggies and this just inspired me! Thanks for sharing! Delicious! We made it for dinner tonight with our last garden zucchini. It took more than 4 cups of stock but that may have been because it cooled off (I measured my husband’s homemade chicken stock out, put it on to warm, turned my back and it boiled over the pan – not sure how much we lost. But after that, I turned the heat way down, probably too much). The addition of the basil was an wonderful pairing of flavors. We will make this again – thanks for posting the recipe.